Somewhere between the bizarre synthetic squishiness of bleached and refined Wonder Bread and the brick-like crumbly coarseness of gluten-free bread lies a good loaf of nutritious and sliceable gluten-free bread. I don’t eat bread very often but every once in awhile I WANT A PIECE OF GOOD BREAD. Stomp, stomp. You know what I mean, I know you do. I’ve been baking, searching, testing, and tasting for ages and have recently put aside my lovely and expensive Zojirushi bread machine and am making some wonderful hand-crafted breads from scratch. I’ve also been whipping up some amazing semi-hand-crafted loaves from premixed blends, which is easier, but not all that much. Meaning it’s not that hard to make it from scratch. But, first off – bread machine or no bread machine? What do you think? Depends on how much time you have and whether you want to deal with doing it all yourself or not. Bread machines are great because you can just dump everything into the machine, set the controls, and take off for yoga class. When you return, your house smells incredible and you’ve had a good workout while Ms. Zojirushi was busy baking you a nice loaf of bread. Simple – but not as good as it could be. The bottom line is, gluten-free bread should not be kneaded and most bread machines run through a kneading cycle. Kneading develops the gluten, and since we’re avoiding the stuff in the first place, there’s no need to knead. That’s why making GF bread by hand is so much easier than making a loaf containing gluten. You get to skip some major steps. See – aren’t we lucky little bakers? No, you don’t think so? Well, check this out. Hearty Whole Grain Bread that is as good as it gets. 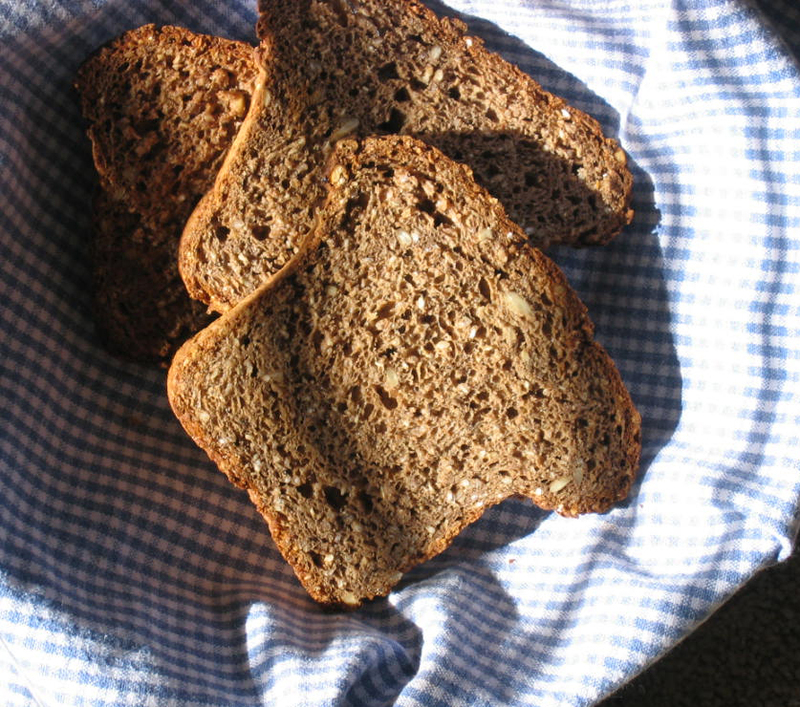 It’s our favorite uncle Bob’s version of whole grain bread from Bob’s Red Mill. But it works much better without Ms. Zojirushi messing with things – unless you can program her to skip the shimmy-shimmy pole dance at the beginning of the process. That over-mixing makes for coarser and more crumbly bread. The loaf pictured below took all of about 30 seconds to mix, no more or you’ll be back to baking edible doorstops. You do have to dissolve the yeast in warm water, mix up a few ingredients and let the bread rise in the loaf pan for 45 minutes or so before baking, but that’s about it. Easy-peasy, as my favorite Brit would say. Now onto a less hearty version of homemade bread. 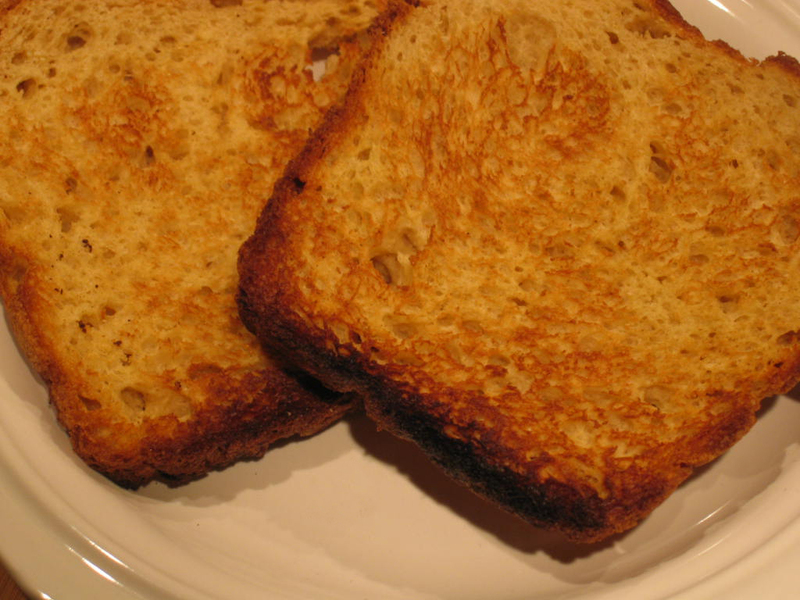 This one makes great sandwich bread, or toast, or French toast, or a real grilled cheese sandwich if you’re totally down in the dumps and need some comfort food, or – well you get the idea. It’s good stuff (see below). 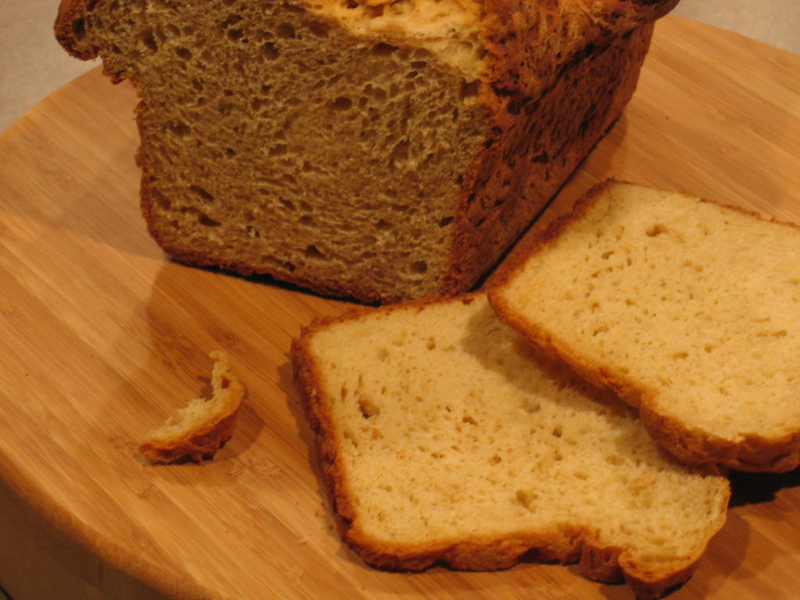 Yippee – real bread and you made it from scratch (sort of)! This entry was posted on Tuesday, January 29th, 2008 at 1:56 pm	and is filed under Gluten-Free Recipes. You can follow any responses to this entry through the RSS 2.0 feed. You can leave a response, or trackback from your own site. Wow – I can’t even bake bread with gluten, and this looks fabulous! I love Earth Balance too (it’s the butter in our house) but I’ve never tried baking with it so I’m excited to have a go at using it. It’s so nice to find a blogger from Colorado! I’m originally from Grand Junction and went to college in Fort Collins, so it will always have a soft spot in my heart! I love that you’re committed to healthy food too – I’m always on the look out for good recipes that are healthy and delicious and I can already tell you’re going to be a great source! Thanks!! You’re inspiring me to get back in my kitchen some time soon and give homemade gluten-free bread another try. The egg-free (for me) part trips up some recipes, though. Hi Michelle! Wow, a girl from CSU – welcome back! I use Earth Balance in almost all my baking recipes. It works fine. I love your blog, great info and great photos. And we must be on the same track with February being Heart Month. I’m planning to focus on that a little as well. Yeah, science girls unite! Speaking of science girls, you too Cindy! I am planning some yoga posts, when I don’t know. Lots of ideas ricocheting around in my head, I just need to get them on paper (or computer in this case). Too bad about the seed/nut thing. Bummer! Sally, you can use flax as an egg replacer. Just simmer 1 teaspoon ground flax in 1/3 cup water for about 5 minutes to replace 1 egg. Plus, the flax is high in omega-3s, which is a good thing! Ya’ know – I agree with you! I made the Bob’s Red Mill Hearty Grain bread – and it was ok, but just ok. Now that you’ve pointed out that it tastes better when you make it from scratch, I will try that the next time we make it. Thanks for the tip! I am only 3 days into learning about GF foods. It’s clear to me that if I don’t eat gluten my bathroom activity is more normal. Yay! I’m scared to eat yeast. What’s the deal with yeast and being gluten free?